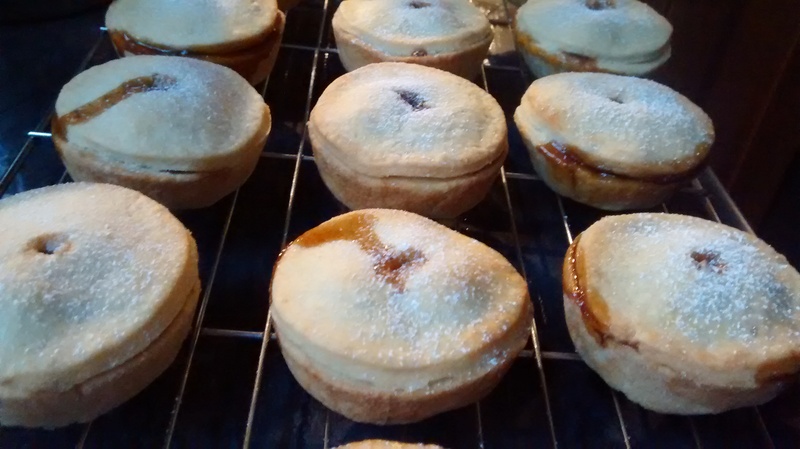 I’ve been using Dan Lepard’s quick mincemeat and extra rich pastry recipes for my mince pies for the last few years. If you follow me on Instagram, you’ll know that I’ve already made two batches to this recipe this year (what can I say? I’m keen! ), but I decided to go with a straightforward sweet shortcrust pastry for my third batch earlier today, mainly due to running out of ground almonds! For this, I adapted a Nigel Slater recipe I found online, while using the last of the mincemeat I made to Dan Lepard’s recipe (albeit with a few variations – see below). Nigel Slater’s recipe is largely fine except for two things: 1) there’s no sugar in it and 2) he doesn’t call for the pastry to be chilled before rolling out. I added some light muscovado sugar and chilled the pastry for 20 minutes just to make doubly sure all would be well… and it was! 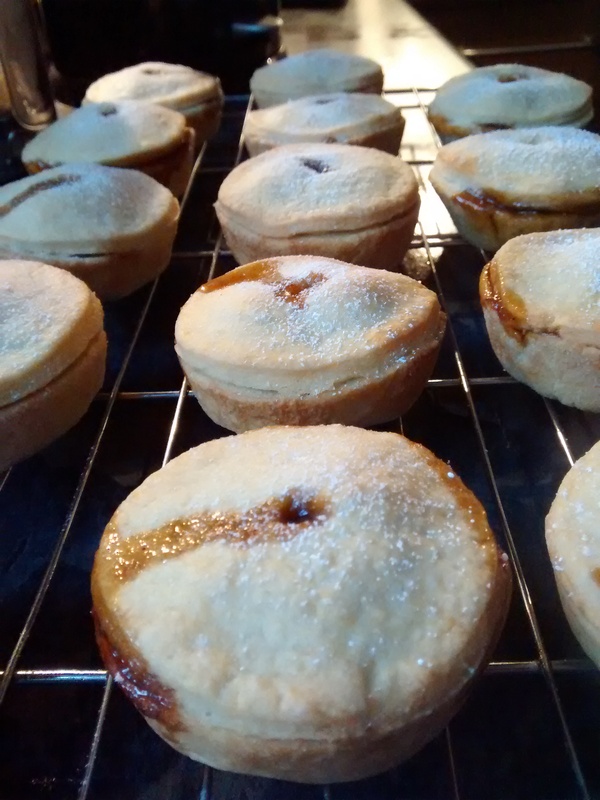 As you can see above, I’ve also been making sure to properly fill my mince pies this year – not that I’m usually stingy with the mincemeat, but as I tend to make slightly thick pastry, it’s always nice to balance it out with a generous helping of the filling. I have to say, the mince pies turned out very well indeed. The pastry is lovely – crisp, buttery and not too sickly (even with my addition of sugar!). The mincemeat I made this year was properly boozy, but also sharp and flavoursome, which is pretty much perfect in my eyes! I need to make some more, but I don’t think I’ll stray too far from my tried-and-tested formula. In a large bowl, rub the butter into the flour with your fingertips until it resembles breadcrumbs. Stir in the sugar, making sure to break up any large lumps. Add the yolk and 1 tbsp of the milk to begin with. Mix and press together until the mixture resembles a rough dough. Add another tablespoon of milk if it looks dry. Turn the dough out onto a floured surface and knead briefly until it comes together properly to create a smoother dough. Wrap the pastry in clingfilm and chill in the fridge for 20 minutes. Pre-heat the oven to 200C/gas mark 6. Grease a muffin tin. Cut some baking paper into strips that you can place in each hole of the tin to help you get your pies out more easily (see the third photo above). Unwrap the chilled pastry and roll out on a floured surface to around 3mm thick. It’s easiest to split the dough into two or three pieces and roll each bit out separately. Use two cutters to cut out two discs of pastry for each of pie – one large disc for the base of the pie and a smaller one for the lid. I use 68mm and 88mm cutters for this, but the sizes you use will depend on your muffin tin. It’s best to cut one big disc, then one small disc, then one big disc, and so on, to make sure you have enough pastry for the same number of base and lid discs. Gently place the larger discs in the holes of the muffin tin (ensuring that there’s a strip of baking paper underneath), pushing them down to the bottom and ensuring the sides are level. You should have baking paper sticking out on opposite sides of each pie. 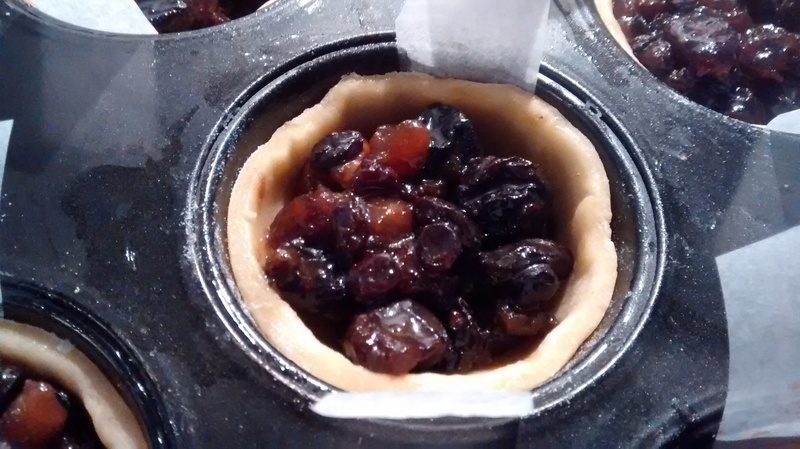 Fill each pastry-lined hole with mincemeat, trying to be as generous as possible without overfilling (keep the filling level with the edges of the pastry). Brush the edges of the pastry with cold water, then place the pastry lids on top, pressing around the edges to close any gaps. Use a skewer or the tip of a knife to cut a small hole in the middle of each pie. Bake the pies in the pre-heated oven for 20 minutes, until they start to brown on top. Leave to cool in the tin for 10 minutes, then use the ends of the strips of baking paper to lift each pie out of the tin and onto a baking rack. When the pies are nearly cool, sift a little icing sugar over them and serve. Happy new year to you all! 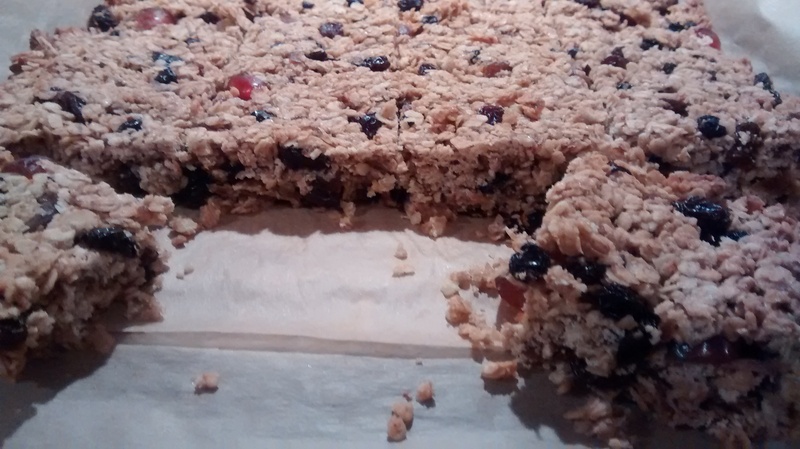 Up until yesterday I hadn’t baked since I made my final batch of mince pies for 2014 on Christmas Eve, but I still had some mincemeat left over, so I decided to make these mincemeat flapjacks to use up the last of it. If you’re well and truly sick of mincemeat by now, this probably isn’t the recipe for you. 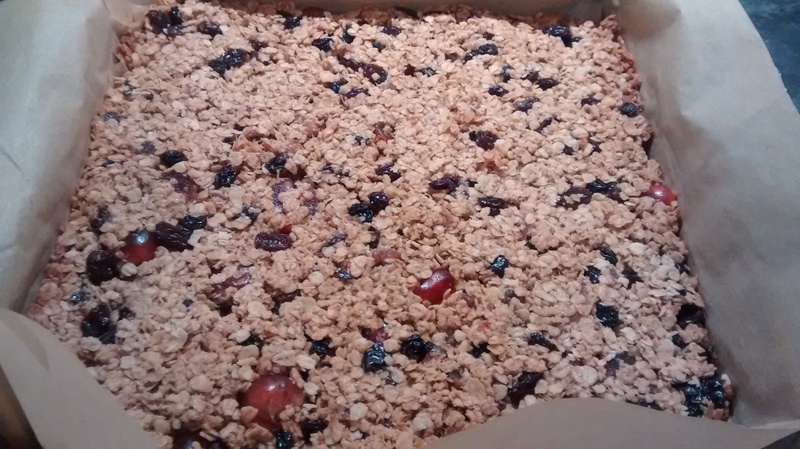 However, I have to say these flapjacks aren’t particularly Christmas-y, despite the mincemeat. I think it’s the oats that dilute the festive flavours somewhat, which is perhaps wise in early January. I found this recipe, which I followed to a certain degree, but I adjusted the quantities to suit what I had (see my recipe below). 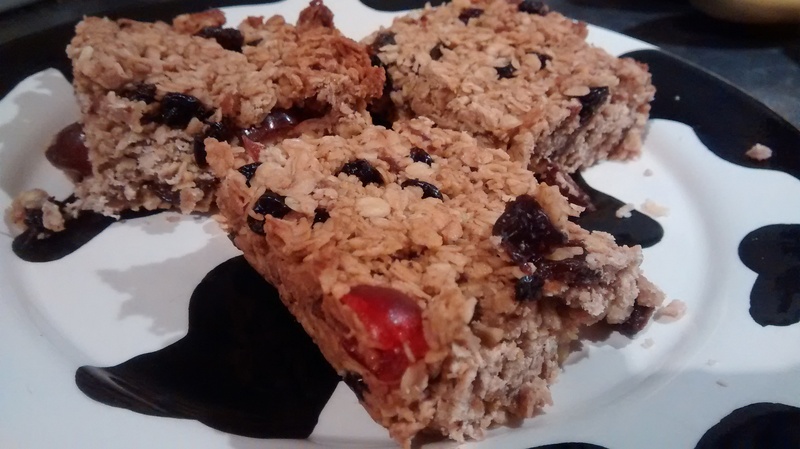 The flapjacks were a doddle to make (like most flapjacks!) so I imagine this would be a nice recipe to follow with the kids, if you have any who are partial to baking! Pre-heat the oven to 180C/gas mark 4. Line a 20cm x 20cm square tun with baking paper. Place the mincemeat, butter and syrup in a saucepan and melt gently over a low heat, stirring occasionally. Stir in the oats, making sure that they’re well coated, then stir in the cherries. Transfer the mixture to the tin and press it down with a spatula, making sure the mix gets into the corners is and is level on top. Bake for 25 minutes or until the oats start to brown around the edges. Remove from the oven and leave to completely cool in the tin, then slice into 16 squares. I ended up baking three batches of mince pies with the mincemeat I made a few weeks ago, but still had lots left over! Which is a good job, as I’d been planning to bake this mincemeat and marzipan teabread for the office’s Christmas bake sale for a while. I do like a good teabread, and this is no exception. It was really easy to throw together, although it did involve rubbing flour and butter together to make ‘breadcrumbs’, which always takes me ages! The final mix, after adding all of the ingredients to the bowl, was fairly thick, and I had to push it right down into the corners of the tin to make sure it didn’t end up a funny shape like my spotted dog. My teabread was done after the hour in the oven specified by the recipe, but my boyfriend made this a while ago and it took him far longer in his electric fan oven. Not sure why, as my oven’s a gas one so you would expect it to take longer in mine! The resulting teabread was delicious – not too dry, packed with fruity, boozy flavours and topped off with lovely moist bits where the marzipan cubes had melted during baking. I thought it seemed a bit flat considering there was self-raising flour in it, but looking at pictures on other blogs, this seems to be a normal size! The recipe recommends serving this in slices spread with butter. I didn’t get a chance to do this, but as it worked so well with the spotted dog, I would recommend doing the same if you ever make this particular teabread! As a Hindu, I don’t really ‘do’ Christmas – happily, there’s no need for me to stress out about presents and cooking a big family meal! I do, however, very much ‘do’ the delicious treats that come with the festive period – especially mince pies. I’ve always had shop-bought mince pies, but decided that, this year at least, I would attempt to bake them myself for a change. Having never even made pastry before (I know, I know), this seemed like a pretty huge challenge! So, after looking at quite a few different recipes, I settled on one particular source that I knew wouldn’t fail me – Dan Lepard’s Short & Sweet. There are a couple of mincemeat recipes in the book – a ‘proper’ suet-based one and another quicker one that’s suitable for vegetarians. I (obviously) opted for the latter, called dark rich mincemeat. The method involves whisking together brown sugar, lemon zest and juice, dark ale (I used Marston’s Oyster Stout) and grated Bramley apple before adding spices (I used cinnamon, ground cloves and mixed spice), raisins (I used sultanas), dried cherries, prunes, currants and more apple and leaving it to thicken on the hob. You then stir in a few tablespoons of brandy or rum (I used Captain Morgan’s Spiced) at the end. I made the mincemeat on Friday night. Yesterday, I steeled myself for my first ever attempt at pastry. 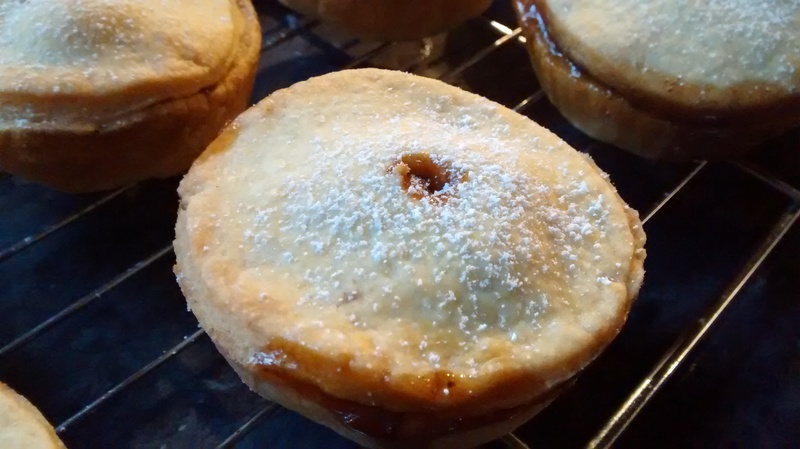 I used the extra rich mince pies recipe in Short & Sweet, as opposed to the standard sweet shortcrust pastry recipe, as I was rather intrigued by the idea of adding cream cheese (yes, really! ), ground almonds and baking powder to the pastry. The addition of these ingredients makes for a sturdier, cakier crust than a normal mince pie might have. The pastry-making went surprisingly well – I only had a near disaster when I realised I hadn’t cut out enough discs to go on top of the pies. Luckily, I had a small bit of pastry left over that I could just about roll out into the correct size! I think the dough could have been a bit smoother, but I had to grind some flaked almonds in a food processor, and they didn’t come out as fine as I’d have liked. I initially followed the recipe by cutting out 10 and 8 cm discs, but as my tray was a little shallower than a standard muffin tray, I decided to switch to 9 and 7 cm discs after doing the first one. You can see the larger mince pie in the top left corner in the pic above. I was a little worried that I’d rolled the pastry out too thick, but it turned out to be just right what with using the smaller sized pastry discs. The recipe required a hole to be cut into the lid of each pie, making them look a bit like pork pies, especially with the lack of fancy crimping around the edges. The holes help the steam escape from the middle during baking. I left them in the oven for the stated length of time – 25 minutes – but I probably should have checked on them earlier, as they came out a little browner than I’d hoped! The browning didn’t matter, in the end. The pies were absolutely delicious; they did indeed feel very sturdy and the crust was pleasingly thick and a little cakey, due to the baking powder, I think. The filling was gorgeous – wonderfully rich, sweet and boozy. I had two warm from the oven and I nearly wept with joy at how lovely they were! I’m very pleased with myself for making these, and for managing to make pastry for the first time! I would heartily recommend the recipes for both the mincemeat and pastry if you like the idea of a rustic-looking mince pie with a bit of heft (and aren’t at all bothered about calories…). Both the mincemeat and pastry recipes are from Short & Sweet by Dan Lepard. 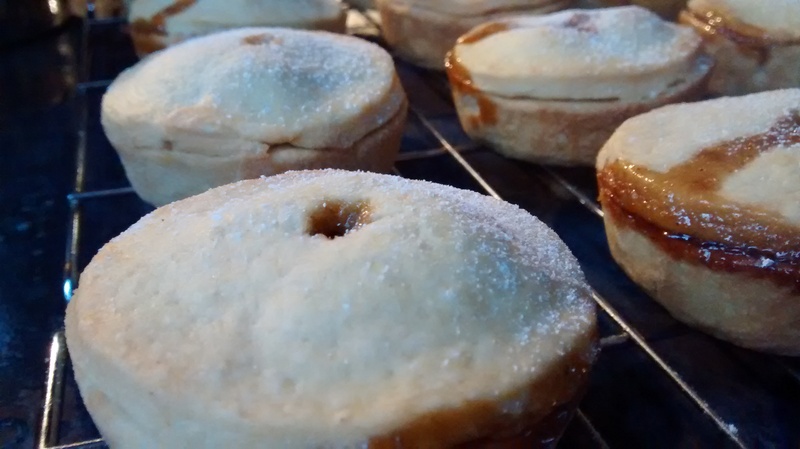 They’re also available online here (mincemeat) and here (pastry).